Sons of Steve Garvey: Greinke On Braun: "The Closer You Were To Him, The More He Would Use You"
Greinke On Braun: "The Closer You Were To Him, The More He Would Use You"
Zack Greinke declined to say anything about Ryan Braun in the days immediately after his former teammate was suspended for violating baseball's drug policy. Uncertain if he wanted to voice his opinion, Greinke asked for another day to collect his thoughts, then another. On Friday, Greinke broke his silence. "I just get nervous talking about this whole situation," Greinke said. Greinke spoke slowly and quietly, but his message was clear: He was disappointed. 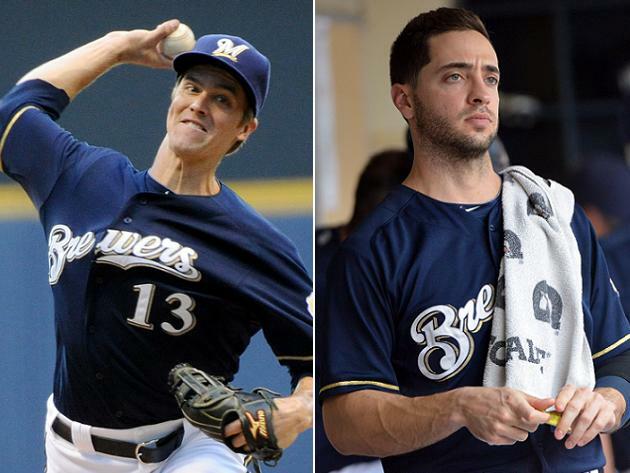 Greinke was on the Milwaukee Brewers in 2011, when Braun tested positive for a performance-enhancing drug in the playoffs. Greinke was also with the Brewers the following spring, when Braun, who successfully overturned a 50-game suspension, told his teammates he never did anything wrong. "The main thing is, yeah, he lied to us," Greinke said. "He forced us to lie for him, threw people under the bus in order to help himself out and didn't care, blamed others for his mistakes, and it's just a lot of things you don't expect from people. " Braun publicly attacked Dino Laurenzi Jr., the man who collected his urine sample. Laurenzi's handling of the sample was the key to Braun's appeal. Oh, yeah, 100% believed him," Greinke said. "Everything was so convincing. He had people to blame. He seemed like a really good guy. He was a good teammate at the time. You don't know the guys that he was pinning it on. I'm not positive, but I think everyone 100% believed him at the time. Especially the next year, he looked just as good as the year before. His numbers his whole career, Hall of Fame numbers. How could you not believe him? He was so convincing." Asked if his opinion on Braun as a player changed, Greinke replied, "Not even talking about the player. It's just the person. Just the fact that he was willing to use anyone that got in his path. The closer you were to him, the more he would use you. It's just disappointing that a human being could be like that." I know Greinke has a tendency to rub people in the wrong way, but I respect him for taking his time to collect his thoughts and sharing them. It's not easy for him to speak publicly under any circumstances, so going to bat for Braun almost two years ago was obviously important to him. Also knowing that, I believe it makes his comments on Friday even stronger. He obviously feels betrayed and used by Braun directly, which is painful enough, but he made it clear that it's just as much about the other people Braun mistreated than it is about Greinke. Can't wait for Braun to come back so Greinke can throw at him. If I were Braun, I'd take what money I have left, and go buy and island and live there. He's not welcome anywhere in the U.S.